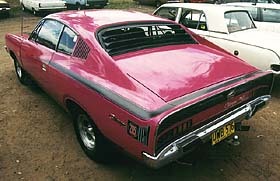 Chrysler Australia's "Magenta" - is it FM3 or not? During the height of the muscle car era (around 1970), the marketing people of several of the world's car companies went a bit silly. One result of this was Chrysler's "high impact" colour range. Colours with great names like "Sub Lime", "Lemon Twist" and "Plum Crazy" were the choice of those who preferred not to be discrete about their muscle machines. And amongst silliest, rarest, and therefore most highly prized was pink (personally I think that silliness is one of the most desirable features in a car). 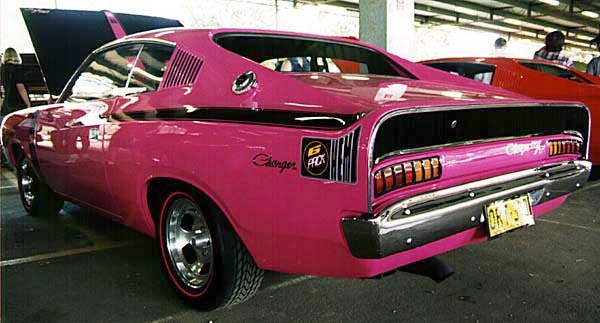 In the USA, the colour in question was designated colour code "FM3", and was variously known as "Panther Pink", "Moulin Rouge" and "Penta Magenta", depending on whether your car was a Plymouth, a Dodge or a Chrysler. (For more on FM3 see Dempsey Bowling's FM3 page and PantherPink.com). Here in Australia a small number of E37 (and maybe E38) Chargers were issued in a colour called "Magenta", seems to be a slightly different shade. Unfortunately the Australian paint codes were totally different to the American ones, and so it is hard to tell. The Australian code for Magenta was "MD". Also, the resulting thread on the RAMM discussion list came up with the info that the Ditzler paint code for FM3 is 2260, and the DuPont paint code for FM3 is 5129. If anyone out there knows the Dupont or Ditzler codes for MD Magenta then we may have a conclusive answer.